1978 Long Beach Civic Center, Long Beach, CA. Photo courtesy of Wayne Thom. Long Beach resident and activist Elliot Gonzalez has been working seven years to get the roof garden atop the public library at the Long Beach Civic Center reopened to the public. The park’s disused, semicircular amphitheater sparked in Gonzalez a dramatic urge, a desire to put on plays and host philosophical discussions. “Like the Greeks,” he said recently over the phone. “It was love at first sight. 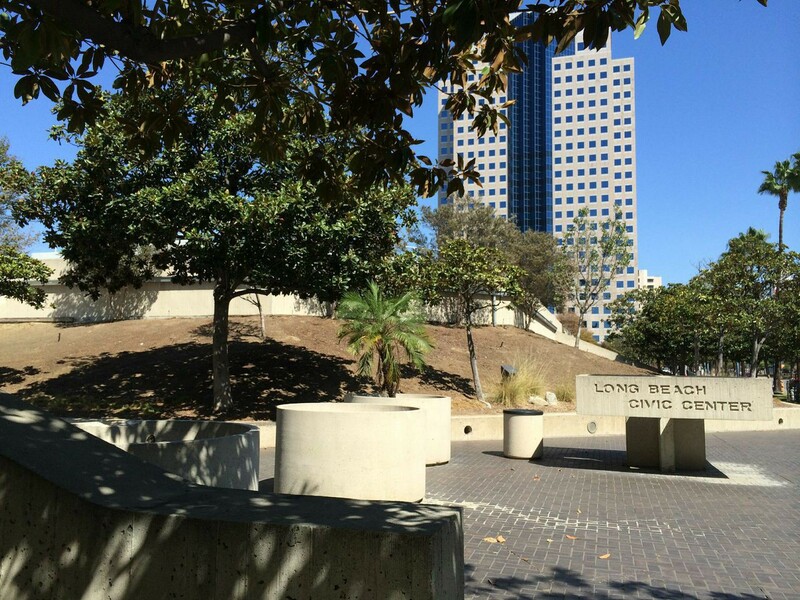 There’s no common, non-commercial place for people to gather in Long Beach, and here is a park at the center of the city.” Albeit, a park that’s been off-limits for more than two decades. (Left) The entrance to the Long Beach Civic Center. 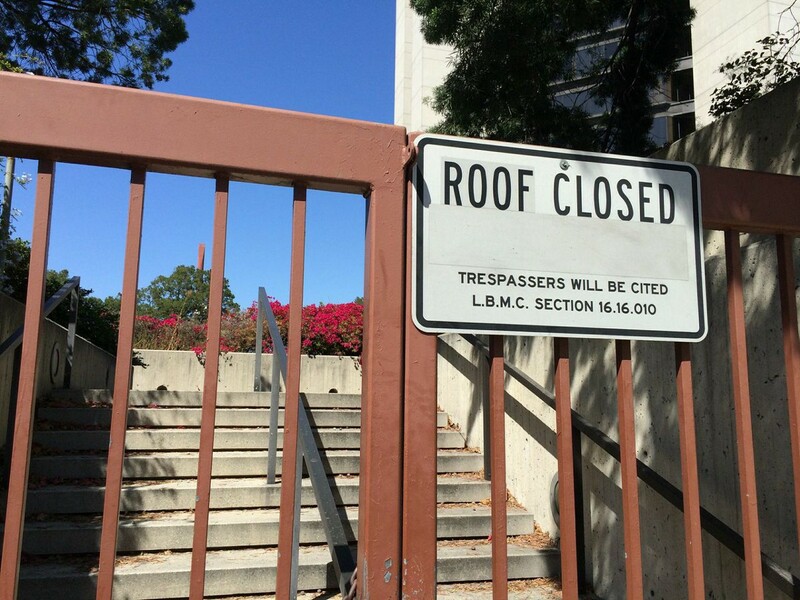 (Right) Access to rooftop garden of public library denied. Photos courtesy of Mimi Zeiger. The Long Beach Civic Center is a difficult landscape. Indeed, it is difficult to love its unmaintained ramparts and windswept plazas. 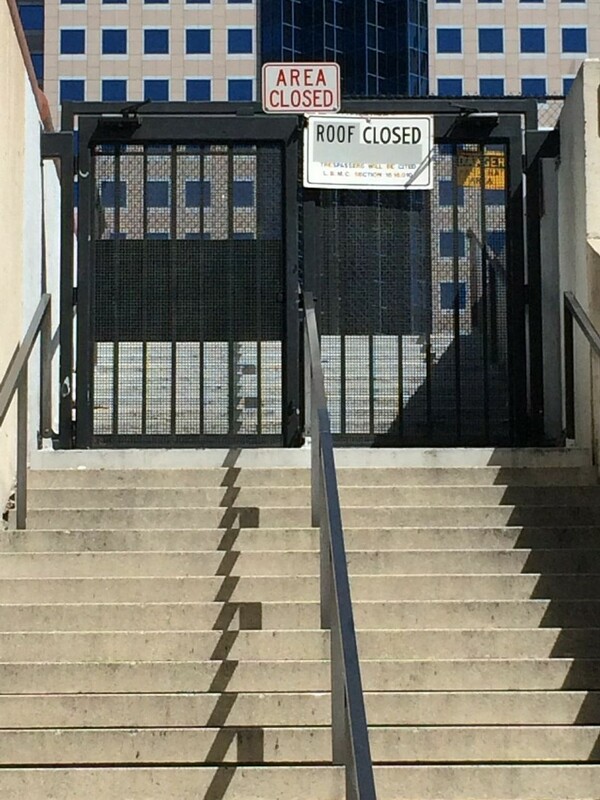 The roof on top of the bunker-like public library is stripped of any greenery and whitewashed to counter the intense rays of the Southern California sun. City Hall rises out of this landscape like Sauron’s Tower, an ominous figure in concrete and dark glass. We can call this landscape brutal in the sense that it employs the concrete and glass language of what some might call heroic or late modern architecture. And it’s brutal because although it is home to the mayor’s office and city government, this complex of buildings, gardens, and plazas is civic in name only. A defense of this difficult landscape is needed not because today it is just as fashionable to bash Brutalism as it is to champion its cause, but because these spaces represent grand gestures in urban design that won’t be replaced if torn down — and presently the Long Beach complex faces demolition and redevelopment. 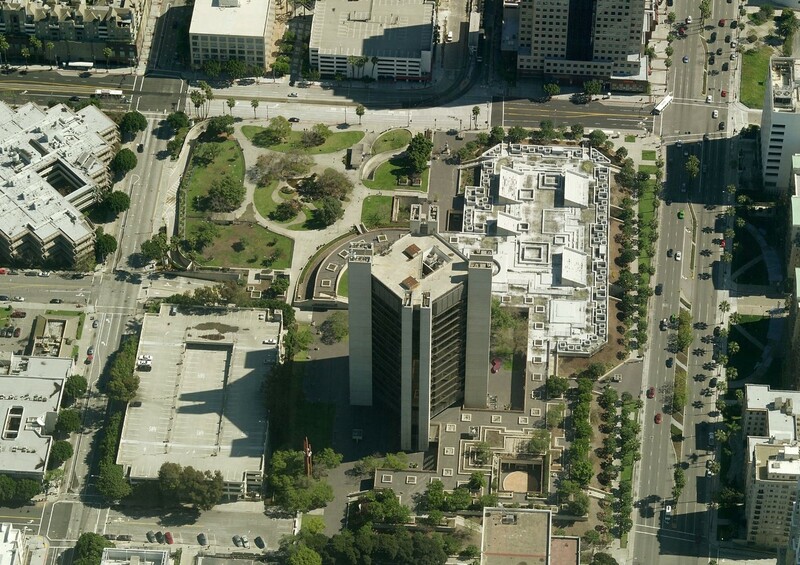 Satellite map view of Long Beach Civic Center. 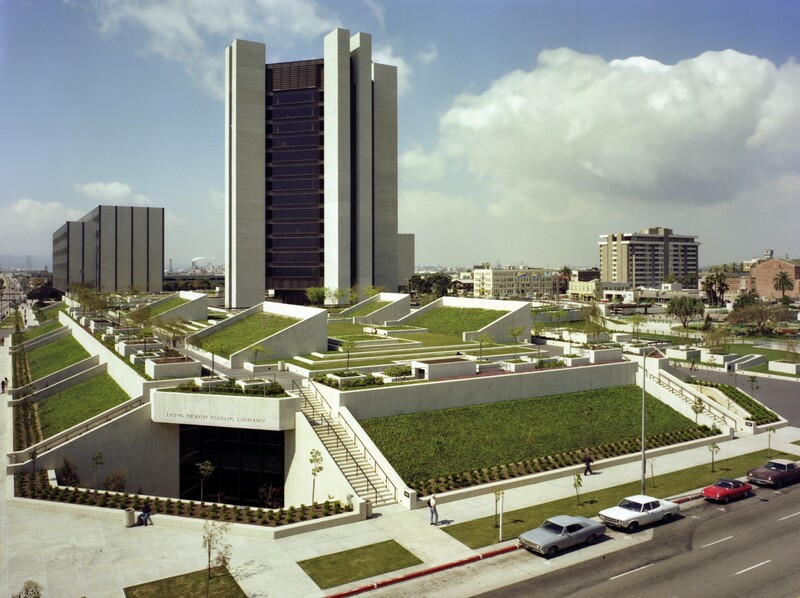 The City of Long Beach commissioned Allied Architects, a consortium including the local firms Gibbs & Gibbs, Architects; Homolka & Associates; Killingsworth, Brady & Associates, and Kenneth S. Wing and Associates, with landscape architect Peter Walker in 1973. The scheme echoes the planted terraces and subterranean galleries of the 1969 Oakland Museum designed by Kevin Roche John Dinkeloo and Associates and landscape by Dan Kiley (recently restored). In both projects, the landscape was conceived as a “village green,” a continuation of the urban fabric. In fact, the Civic Center’s building and plazas occupy what was once a much larger Lincoln Park, an open space that dates back to the city’s founding in the late 1900s. A swath of green space is still preserved as Lincoln Park, however the Civic Center’s rooftop terraces were designed to continue the legacy of public space. Difficult landscapes, then, must bear the responsibility of reconciling both cultural and aesthetic turns. This dual imperative plays out in many cities across the U.S. The Cultural Landscape Foundation keeps track of At-Risk, Lost, and Saved landscape. The non-profit tirelessly charts preservation efforts and development threats in the attempt to protect the heritage of landscape architecture. 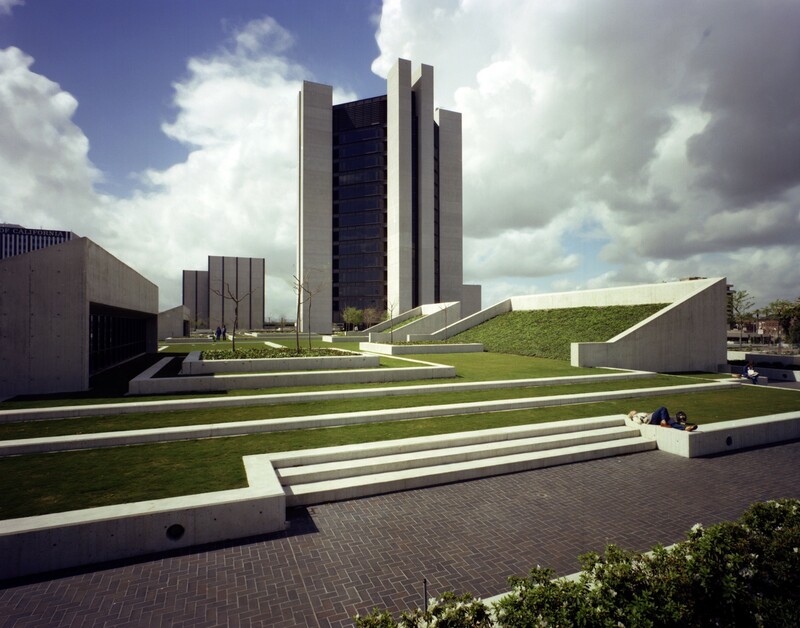 For example the concrete outdoor rooms and fountains designed by Lawrence Halprin & Associates’ Heritage Park Plaza in Fort Worth, Texas was closed in 2007 for being unsafe — a word that captures both the deteriorating condition of the park, but also cultural fear of a downtown public park. In Baltimore, the Modernist concrete, multi-leveled McKeldin Plaza fountain is slated for demolition, spuring local designers and activists to stage “Read-ins” at the fountain in the hopes of reactivating it as a public space. “Musings about a Brutalist building’s friendliness quotient are a distraction,” says Anthony Carfello, an artist and curator working in L.A. County. In his 2013 participatory art project “Located in Long Beach,” Carfello visited chain stores and franchises. He suggests that design concerns that call for total redevelopment mask the behind-the-scene benefits to private developers given at the expense of Long Beach locals. “Residents pay for the dulling of their own community.” Public/private partnerships, however, don’t always have to lead to the conventional, to conforming approaches to urban design and landscape that privilege commercial outcomes and public spaces that double as outdoor shopping malls — perhaps one of the most important lessons of the High Line in New York. 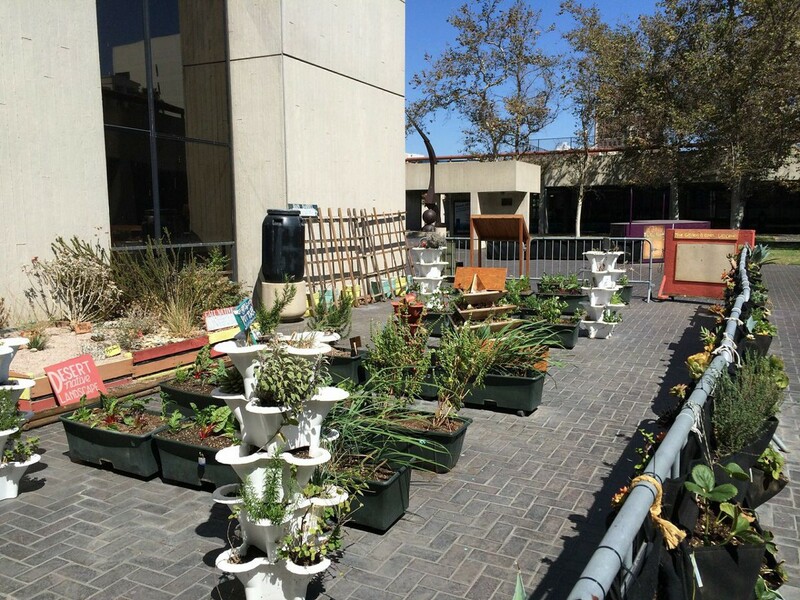 (Left) Plants bask in the sun on the rooftop of the public library. (Right) Access to this garden prohibited. Photos courtesy of Mimi Zeiger. The Downtown Long Beach Metro stop — the last stop on a line that connects back to Los Angeles — drops passengers off on 1st Street across from the Civic Center. The street is lined by some of the city’s older structures and a mix of late 20th-century office buildings. As a piece of urbanism, 1st Street tries incredibly hard to make small-scale gestures into a larger whole, something that speaks to the aspirations of Long Beach. There’s a promenade, swoopy sunshades, mosaic street art, and business district banners. It’s begging to be liked. And in doing so, it fails to make much of an impact. By contrast, the character of the Civic Center is broad-gestured and democratic, but demands activity at a civic scale and eschews the niceties of streetscape. It’s difficult, for sure, but not incapable of being loved.